RateGenius is a nationwide online lending platform. 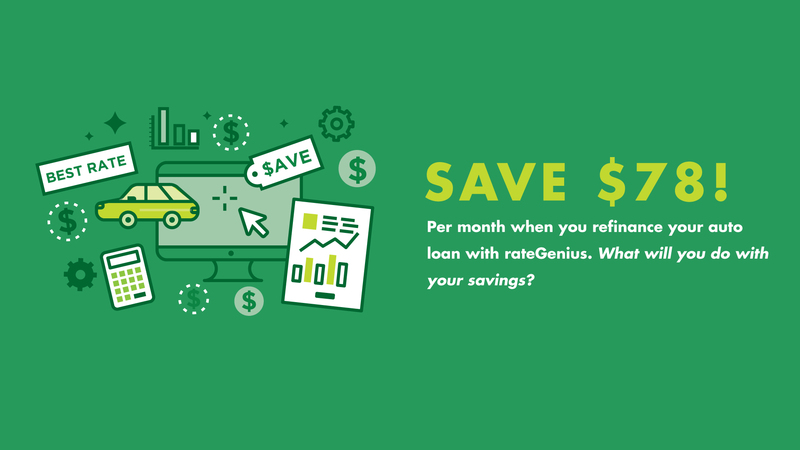 With more than 150 competitive lenders, rateGenius can find customers the most competitive vehicle interest rate to refinance their loans on cars, trucks, and SUVs. I applied, and within a day obtained a response. My loan manager from RateGenius was knowledgable, and extremely helpful. I obtained a great rate offer, and was able to smoothly transition loans. It was an awsome experience! I am so greatful to have refinance through RateGenius. Too Easy!. I applied, and within a day obtained a response. My loan manager from RateGenius was knowledgable, and extremely helpful. I obtained a great rate offer, and was able to smoothly transition loans. It was an awsome experience! I am so greatful to have refinance through RateGenius. Awesome loan processing.. They saved me thousands. The team at RateGenius was instrumental in getting me a great rate on refinancing my truck, The whole process happened quickly and efficiently. Dropped my payments by $67/mo overnight The team at RateGenius was instrumental in getting me a great rate on refinancing my truck, The whole process happened quickly and efficiently. It was the best thing I have done.. It save me alot of money. It was the best thing I have done.. It save me alot of money. Robert Colby has helped me on two different occasions over the past 6 years. He is so good at what he does the whole process is made simple and uncomplicated. He has it choreographed with calls and reminders to make everything easy. He's very bright & a pleasure to work with, I highly recommend him. I was a little weary refinancing through Rate Genius because of a few negative reviews, but Yvette did a great job helping me get a better rate. I was paying 26%, but she was able to find someone to refinace with 5% interest - I cried. Thank you, Rate Genius and Yvette for everything you have done for me! !